Sign up to receive notifications on future publishing opportunities! Literacy has traditionally been associated with the linguistic and functional ability to read and write. Today, however, we have moved away from this perception to a more complex and multivalent definition that introduces new literacies that prepare students to reach their full potential in the 21st century (Lankshear & Knobel, 2011). This edited volume will focus on literacy in diverse and multilingual settings in education. Although literacy, as a fundamental issue in education, has received abundant attention in the last few decades, the majority of publications to date have focused on monolingual classrooms. Taking the expanded definition of literacy as an ability of humans to achieve their goals and develop their potential (UNESCO, 2006) as a point of departure, as well as considering the recent shift from the monolingual to multilingual focus in literacy practices (Lankshear & Knobel, 2011; Edwards, 2015), this book will examine approaches to multiliteracy instruction in linguistically and culturally diverse settings. This book aims to explore the multifaceted nature of literacy development across the lifespan in a range of multilingual contexts. Chapters will be grounded in current research, demonstrating theory-practice connections as demonstrated through innovations in pedagogy, curriculum and materials design, and teacher education. In addition, we hope to offer unique perspectives through a critical reflection on issues related to power, ownership, identity, and the social construction of literacy in multilingual societies. Recognizing that literacy instruction in contemporary language classrooms serving diverse student populations has to go beyond developing reading and writing abilities, this book sets out to explore a wide range of literacy dimensions. The complexity of literacy instruction lies in the need to prepare learners to listen to, read, view, speak, write and create oral, print, visual, and digital texts and to use and modify language for different purposes as well as “to access, understand, analyse and evaluate information, make meaning, express thoughts and emotions, [and] present ideas and opinions” (Australian Curriculum, Assessment, and Reporting Authority, 2016, p. 1). Recent literature highlights the difficulties learners face as literacy demands in the 21st century grow, and further underscores that language teachers are not adequately prepared to respond to the emerging and ever-broadening changes in literacy (Breivik, 2005; Hobbs, 2008; Lankshear & Knobel, 2011). As a resource for use in language teacher preparation programs globally, this book will provide a range of theoretical and practical perspectives, while creating space for pre- and in-service teachers to grapple with the ideas in light of their respective contexts. Language teacher educators have a responsibility to prepare teachers to be culturally responsive and flexible so they can adapt to the range of settings and variety of learners they will encounter in their careers, while also bravely questioning the assumptions they are encountering about multilingual literacy development and instruction. This book will serve as a textbook or a supplementary course material in Europe, North America, and other multilingual contexts. It is intended for use in pre- and in-service foreign and second language teacher education programs preparing students to work with linguistically and culturally diverse student populations. The target audience includes pre- and in-service teachers, and teacher educators (lecturers, professors, practicum supervisors). The book will also be of interest to foreign language materials/course developers as well as graduate and post-graduate students working on additional language acquisition/multilingualism from linguistic and pedagogical perspectives. - Power - Whose literacy? Whose language? Whose pedagogy? Researchers and practitioners are invited to submit on or before April 25, 2019 a chapter proposal of 1,000 to 2,000 words clearly explaining the mission and concerns of their proposed chapter. Authors will be notified by May 5, 2019 about the status of their proposals and sent chapter guidelines. Full chapters are expected to be submitted by August 23, 2019, and all interested authors must consult the guidelines for manuscript submissions at http://www.igi-global.com/publish/contributor-resources/before-you-write/ prior to submission. 1. 5-7 keywords with definitions. 2. Theoretical background – In this section, contributors will present up-to-date research on the aspect of literacy that is the key focus of their chapter. 3. Practical applications – This section will discuss how the theoretical concepts presented in the first part of the chapter can be applied in the classroom. The contributors will be asked to include one extended example, which will be showcased in a box called Teaching Tips. 4. 2-3 discussion questions – To make the text easy to use in the classroom, each chapter will include reflective questions related to the issues presented in the chapter, which can be used as a prompt for classroom discussions or writing assignments. 5. An annotated bibliography of 3-5 suggested further readings – Each chapter will include a list of recommended further readings with short annotations to enable the readers to select the sources most relevant to them. The authors must follow APA style for in-text citations and references, and titles/subtitles within chapters should not be numbered. All submitted chapters will be reviewed on a double-blind review basis. Contributors may also be requested to serve as reviewers for this project. Note: There are no submission or acceptance fees for manuscripts submitted to this book publication, Handbook of Research on Cultivating Literacy in Diverse and Multilingual Classrooms. Chapter authors will receive a 40% discount offer from IGI Global if they wish to purchase the whole Handbook. All manuscripts are accepted based on a double-blind peer review editorial process. 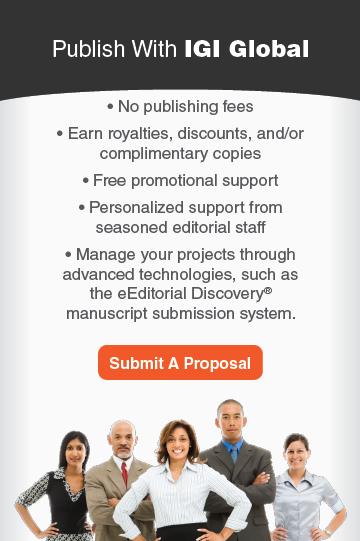 All proposals should be submitted through the eEditorial Discovery®TM online submission manager.